I’m thrilled to announce that the Gravity Flow WooCommerce Extension has been released. 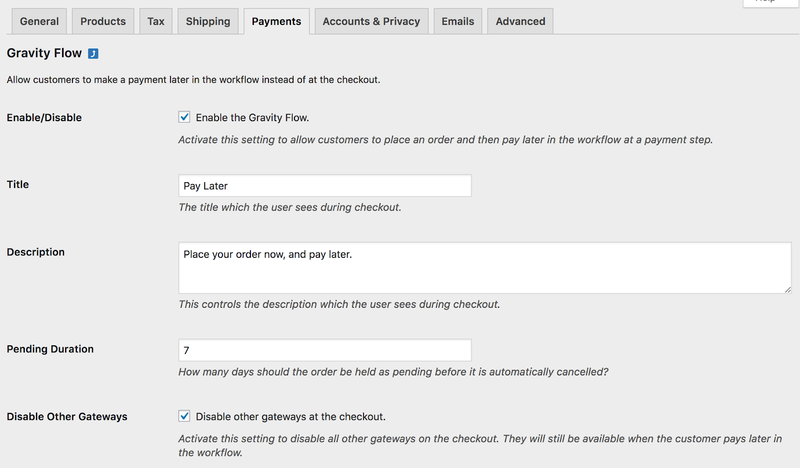 The Gravity Flow WooCommerce Extension adds workflow automation to WooCommerce orders empowering store owners to integrate orders more deeply and more efficiently with the business processes. Every time an order is created in WooCommerce, an entry is automatically created in Gravity Forms and Gravity Flow will trigger the first step in the workflow. Payment – This step allows a customer to submit a payment for an order at any point in the workflow. Refund – The step will refund a payment. Capture Payment – This step will capture the payment which was pre-authorized at the WooCommerce checkout but not captured. Cancel Payment – This step will cancel the payment which was pre-authorized at the WooCommerce checkout. The extension adds a special Payment Gateway in WooCommerce which allows customers to pay at a later date using the Payment workflow step. Alternatively payments can be authorized at the checkout and then the payment can be captured at a later date using the Capture Payment step. For example, the payment for a translation project can be authorized at the WooCommerce checkout, then the automated workflow controls the flow of information between the customer, the translator and the project manager, and finally, once the project is complete, the payment is captured. A different form can be used to set up an automated request process where the customer can request a refund and, from a one-click approval link in an email, the store manager can refund the payment without having to log in to WordPress or the payment gateway. To make it as easy as possible for WooCommerce store owners to get started with workflow automation, we’re including an official license for Gravity Forms at no additional charge for the first year along with the purchase of Gravity Flow and the WooCommerce Extension or the Ultimate License (new customers only). At my last job we sold mentor-lead online courses. After someone paid they had to fill out a form to request a mentor. A group of five mentors would claim the new student, first come first served. Students would also rate mentors. We would stop payment if a mentor was bad.